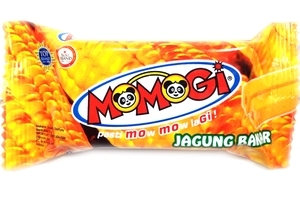 Sari Murni Momogi Corn Stick Roasted Corn Flavor Snack (Stick Jagung Bakar) in 0.35oz (10g) pack. Pasti MOw MOw laGI! Product of Indonesia. Halal Certified حلال .